Suzi Redino estimates that only 5 to 10 percent of the furniture and decorations in her yard were purchased. The rest were picked out of the garbage. Literally. Suzi specializes in trash to treasure in her interior design business, Cherry Tree Design. Her husband Rick’s family business is a junk yard, R & R Salvage. Almost every day he brings something home to her, and many of the items find their way into her yard. 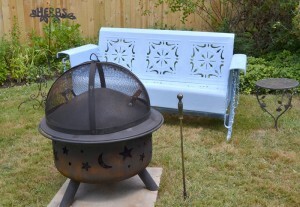 “That’s from the junkyard,” she said pointing to the washtub that now serves as a planter, “and that’s from the junkyard,” pointing out the metal coffee table that the tub rests on. She picks ups some items from the roadside, too. “That pot was garbage picked,” she said, pointing to still another item. 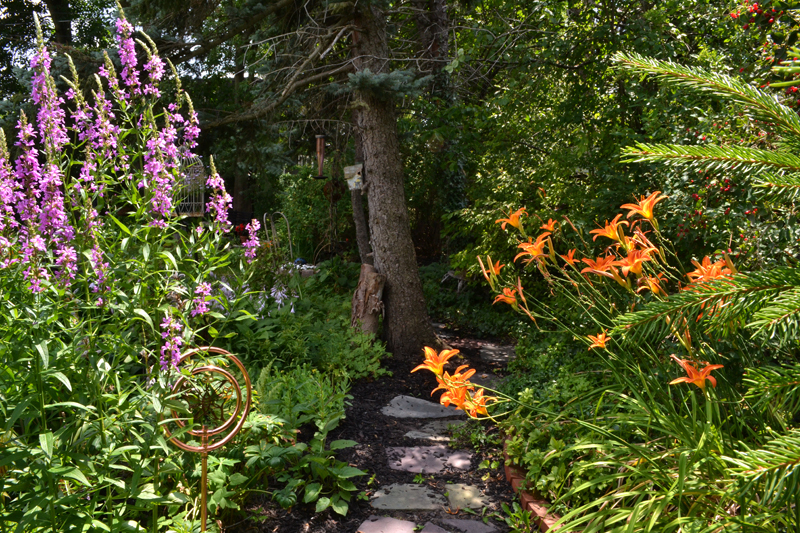 Redino shared her yard at 457 Ruskin Road, Snyder, on July 8 during the 10th annual Snyder-CleveHill Garden View. The event is sponsored by the H. K. C. Business Association. A bird cage and a metal globe of the world hang from tree limbs. There are several chimineas, all from the junkyard. “If it’s metal, it’s probably from the junkyard,” she said. That includes the lovely metal chairs for her patio set, which just needed a bit of work with a wire brush and a coat of spray paint. The metal glider in the photo above left is from the junkyard, too. 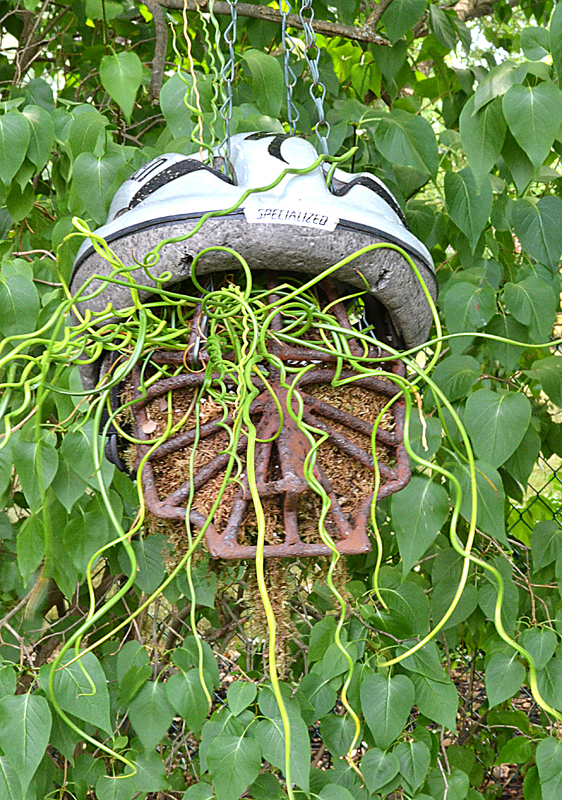 One of the more unusual items is the iron mask at right that has been turned into a hanging planter for corkscrew grass. 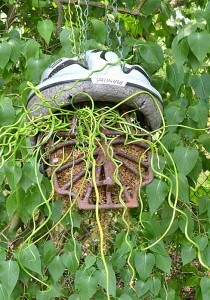 Her husband, who is an avid bicyclist, popped a helmet on top. Redino has vegetables and herbs long the side fence, and she lay bricks to define the edges, just as her father used to do. 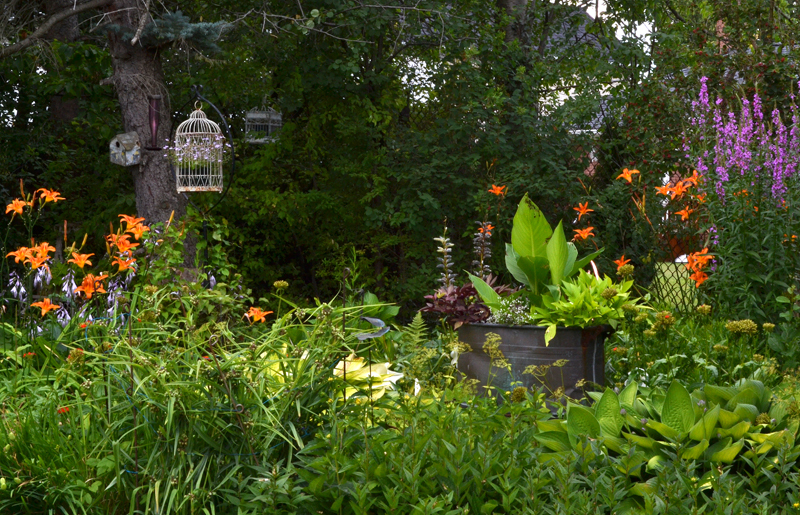 Her perennial flower garden undulates along the back fence and a path winds its way through the lush vegetation. 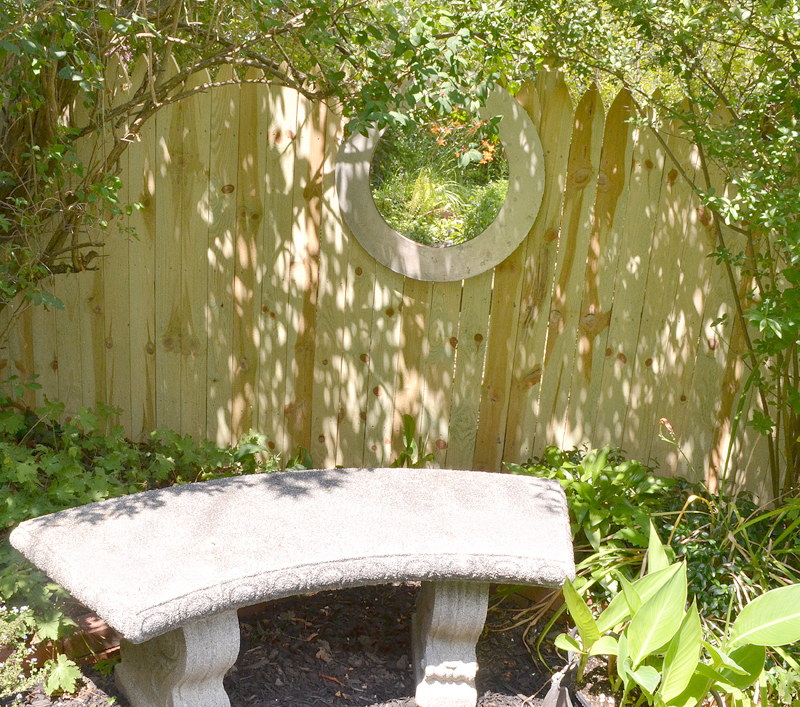 A stone bench from her childhood home is set in a nook at the beginning of the path, offering a quiet place to relax. What at first looks like a window cut in the fence is actually a mirror. 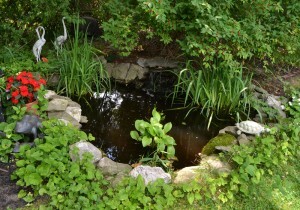 But her backyard didn’t always look this way. When the Redinos moved into their house in 1986, vines wound their way in and out of the chain link fence all the way up to the telephone wires. Redino decided to wear a bikini while attacking the vines with a machete. Unfortunately, the vines were poison oak. “Except for three little triangles, I had poison oak everywhere,” she said, and spent a miserable week soaking in the tub. When it comes to gardening, here’s Redino’s advice: “Be creative and keep plugging away.” Flowers don’t always grow where you plant them, and if things don’t work out, you have to try again. “Just when you think you get it right, three pine trees come down in your backyard and you have to start from scratch,” she said. It was on New Year’s Eve, a few years after the October Storm, when three of her pines toppled over, damaging a fence and gutters. “I have so much sunshine now!” Redino said, and she thinks the part of the garden that had been damaged is even prettier than the part still shaded by the remaining pines. While she has rabbits in her yard, they only eat the clover and don’t bother her plants. To prevent her bulbs from getting dug up by critters, she plants a moth ball alongside her bulb. “I think it works like a charm,” she said. A pond with a waterfall catches visitors’ attention, as do the wonderful decorations placed here and there around the perimeter. 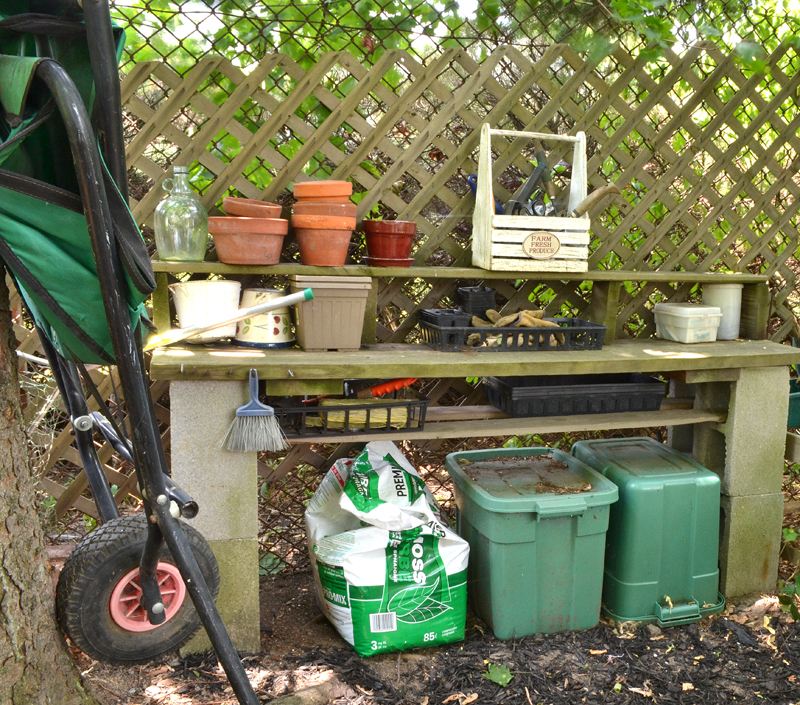 But tucked behind the pond, and obscured by lattice and foliage, is what gardeners would really envy– a roomy work area. Redino even has a potting bench. “Recycle, reduce, reuse” – I love it! Thanks for the words of encouagement. Should my pine trees ever fall I can refer to the idea of added sunshine I can count on.